A total 6,594 people were claiming JSA, a rate of 3.2%. This is an increase of 1,939 (41.7%) on the same time last year, although it’s worth noting that the recession was in full swing by then. Wandsworth continues to perform well against London and the country as a whole. 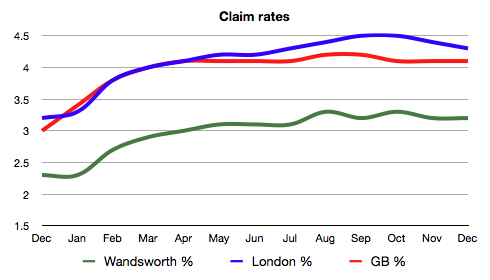 Nationally the claim rate remains the same at 4.1%, but London wide the rate has dropped from 4.4% to 4.3%. The small fall in Wandsworth was not big enough to change the rate which remains at 3.2%. What is interesting is how the rates seem to have plateaued for a few months now. In previous recessions unemployment (and therefore out-of-work benefit claims) has continued to rise for some time after the recession has ended as employers deal with the effects. Indeed, it may well continue to rise this time with people returning to benefit after season work has ended. Or it might just be that this recession is different. Only time will tell.